Like pickleball, POP Tennis is hoping to find a home as a social racket sport for players of all skill levels. NORTH BETHESDA, Md. — What’s the worst part about playing tennis? It can be tough to find a partner of equal ability to provide a good game. For those without a lot of skill, points are often short, and overhand serving can be a haphazard proposition. You may spend just as much time chasing errant shots around the court or fetching balls from over the fence. All of these things are reasons pickleball has risen in popularity over the past few years. Now there’s POP Tennis, which attempts to address some of its original cousin’s shortcomings in the same way, while providing a fun, social game on an actual tennis court. The game is played on a 60- x 21-foot court (or a regular court marked with additional lines), with a regular tennis net. Comparatively, the pickleball net is shorter, and the game played with a large plastic ball. POP Tennis players serve underhand, on the fly or the bounce, and get only one serve. But unlike pickleball, the rules and scoring are otherwise identical to regular tennis. “There’s not quite as much running and moving as there would be in regular tennis, but the racket skills and things like that still can be hugely beneficial,” said Mark DiChiara, Director of Tennis at Georgetown Prep Tennis Club. 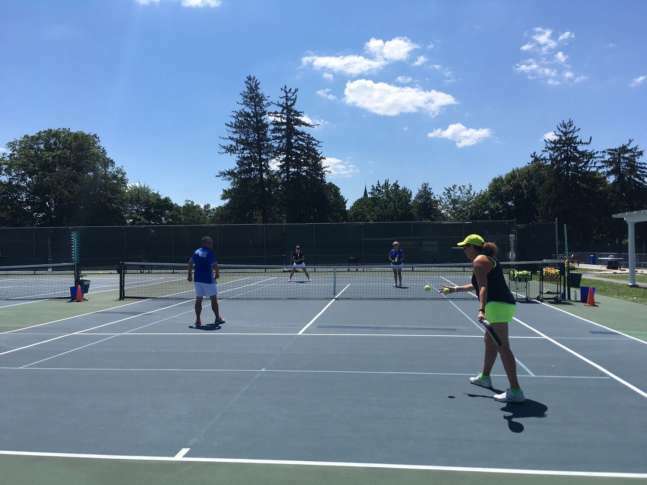 Five or six years ago, the USTA offered to paint lines on courts at clubs all around the country for free, footing the bill to outfit them for 10-and-under junior play, as well as POP Tennis. While not every club took them up on the offer, there are some 18,000 stand-alone courts or those with the painted lines across the country. One such club is the one at Georgetown Prep, where the USTA spent about $2,000 through its facilities grant program repainting courts with the new lines. “It’s getting to be where almost everywhere you look, some courts have the 10-and-under lines on them,” DiChiara said. The sport compensates for the tighter space with lower compression tennis balls, specifically designed for the 60-foot court. It also uses a memory foam composite racket with holes in it as opposed to a strung tennis racket, which does not have nearly as much spring. The slower ball speeds and tighter spaces mean fewer tight angled shots, keeping the ball better contained in an area where players of all abilities can chase it down. He’s been using the game as a change-up to traditional tennis for those who train several times a week, as well as a way to get new players involved. One unexpected, welcome side effect: it’s been more fun for the players than he anticipated.